MIAMI | This is the second installment of the “60 for 60” campaign, aimed at recognizing members of the faithful who contributed their time, talent and treasure in building up the Archdiocese of Miami over the past 60 years. Sisters of St. Joseph of St. Augustine serving throughout Florida pose for a photo after the premiere of the documentary on their 150-year presence in the state, "Legacy of Faith," in 2016. The Sisters of St. Joseph of St. Augustine are a congregation of Catholic women serving throughout the state of Florida in a variety of ministries. Arriving in South Florida in 1905, the sisters established St. Catherine’s Academy (later Gesu School) in Miami. One year before the parish of Little Flower was established in 1925, the sisters founded St. Joseph Academy (now St. Theresa School) in Coral Gables. They also founded Mercy Hospital in 1950. The sisters are best known for their dedication to educating African-American children during segregation in Florida, which led to the arrest of three sisters. A judge later dismissed the case. Today, three Sisters of St. Joseph minister full time in Miami in schools, parishes and diocesan offices. Sisters of St. Joseph also taught a young Thomas Wenski at Sacred Heart School in Lake Worth. 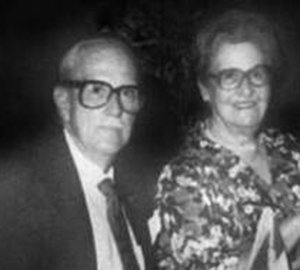 Born in Havana, Cuba, the Grau siblings became a driving force in the Pedro Pan airlift, where Cuban parents sent their children to the United States to escape Fidel Castro. From 1960 to 1962, Ramón and Polita, recognized as the “godmother” of the operation, along with Msgr. Bryan O. Walsh in Miami, spearheaded the movement that helped more than 14,000 children leave Communist Cuba. In 1965, both were arrested for that work and sentenced to 30 years in prison by Cuban authorities. Polita served 14 years before being released in 1978; her brother was freed in 1986. Both came to live in Miami after their release. 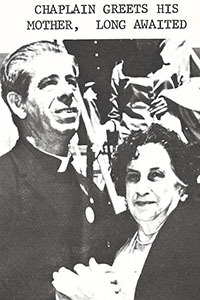 Father Jose Ignacio Hualde is shown in this newsletter receiving his own mother when she arrived on a Freedom Flight from Cuba. Ordained in July of 1936, Father Hualde served the Archdiocese of Miami in various parishes and churches until his death in 1989. Not only did he offer Sunday Mass at the Freedom House in Miami, he was assigned by Archbishop Coleman Carroll to greet the Freedom Flights when they landed at Miami International Airport throughout the late 1960s and early 1970s. Through his over 50 years of service, Father Hualde helped hundreds within the archdiocese strengthen their spiritual lives and faith. Unaccompanied Cuban minors brought to the U.S. via Operation Pedro Pan were told to “ask for George” when they landed at Miami International Airport. “George” was Jorge Guarch. Unaccompanied Cuban minors brought to the U.S. via Operation Pedro Pan were told to “ask for George” when they landed at Miami International Airport. 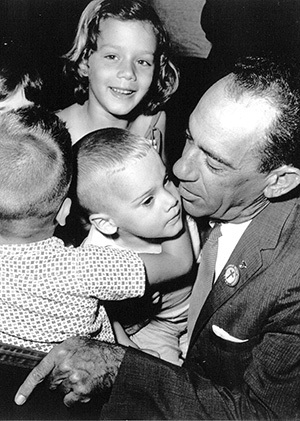 “George” was Guarch, who throughout 1961 greeted all the children when they got off the plane. He also took meticulous notes and catalogued each child’s name, date of birth, type of entry visa and lodging location. His notes became the foundation for The Miami Herald’s Operation Pedro Pan database. This made it possible to archive the Pedro Pan children into a searchable database and immortalize the historic exodus. After being expelled from Cuba, the Dominican Sisters of St. Catherine de' Ricci worked with Cuban refugees and later operated the Dominican Retreat House (now known as Morningstar Renewal Center) in Pinecrest for more than 40 years. Before merging with the Dominican Sisters of Peace in 2009, the Dominican Sisters of St. Catherine de' Ricci were founded as a pontifical institute dedicated to the faith formation and spiritual life of women. In Cuba, they established three academies which were later taken over by the Castro government. When they arrived in Miami, the de’ Ricci Sisters served the community by working with Cuban refugees until 1971 and operating the Dominican Retreat House (now known as MorningStar Renewal Center) in Pinecrest for more than 40 years. 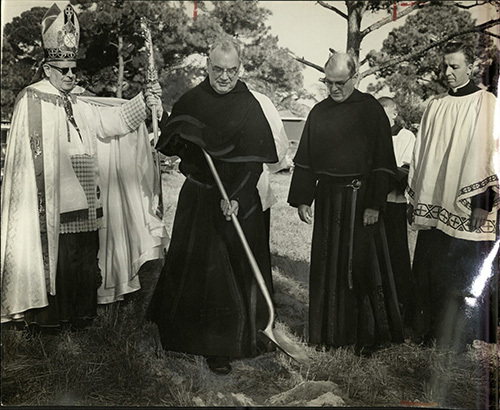 Augustinian Provincial Father James A. Donnellon breaks ground for the first Catholic men's college in South Florida, now St. Thomas University, as Bishop Coleman Carroll, left, and Augustinian Father Edward McCarthy, second from right, the new college's rector, look on. After being expelled from Cuba by the Castro regime in 1961, American Augustinians who ran the Universidad de Santo Tomás de Villanueva in Havana came to Miami and founded St. Thomas University that same year, naming it Biscayne College. The Augustinian Friars led the university to come under the sponsorship of the Archdiocese of Miami in 1988, making it the only Catholic archdiocesan-sponsored university in the state of Florida. Mother Miranda, a religious of the Sacred Heart, is best known for founding Centro Mater. Located in Little Havana, this institution was the first Florida child care center to combine pre-school with before and after school programs. Since Mother Miranda first opened Centro Mater in 1968, it has continued to grow and to offer education and childcare to low-income families, now doing so in five campuses in Miami, Hialeah and Hialeah Gardens. The Enrico family contributed generously to the Archdiocese of Miami by donating 10 acres of land to the development of the St. Jude Parish in Boca Raton during the 1970s. Thanks to the family’s generosity, the church has grown and served its community since 1979. In later years, the archdiocese aided in naming St. Rita’s church in Wellington after the Enrico family matriarch, Rita. 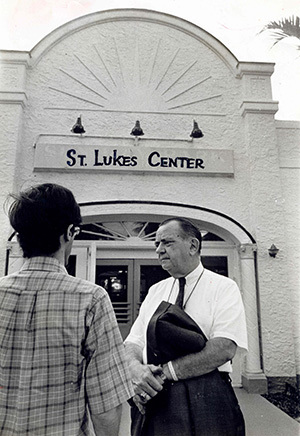 Dr. Ben Sheppard established the first methadone clinic in Miami, named St. Luke’s Methadone Drug Treatment Center and operated under the auspices of the Catholic Welfare Bureau (now Catholic Charities). Dr. Sheppard is known for establishing the first methadone clinic in Miami, named St. Luke’s Methadone Drug Treatment Center. It operated under the auspices of the Catholic Welfare Bureau (now Catholic Charities). As both a pediatrician and psychiatrist, Dr. Sheppard believed that the center should be not-for-profit and staffed with qualified volunteers and medical professionals. He also was involved in the local community and often spoke at seminars in different locations across South Florida. In 1976, Anthony and Genevieve Abraham created the Anthony R. Abraham Foundation as an institute dedicated to charity and community service. Along with their son, George, the Abrahams worked through the foundation to provide education and support for those in need in the community. Within the Archdiocese of Miami, the Abraham Foundation donated to various institutions, includingCamillus House and the Maronite Catholic Church. The foundation also contributed a generous donation of $50,000 to the entire archdiocese in 2013. Shula is best known as the head coach of the Miami Dolphins from 1970 to 1995, where he led the team to two Super Bowl victories and an undefeated season. Aside from his professional accomplishments, including holding the NFL record for most career wins as a head coach, Shula is known for his involvement within the South Florida community. Shula and his wife launched a $10,000 annual scholarship endowment fund that assists one local family with a child in public school to transition to a Catholic high school in the Miami archdiocese. 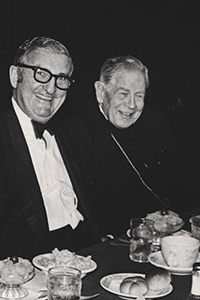 Joe Robbie is pictured here at a fundraising dinner with Archbishop Coleman Carroll. Robbie was the founder and president of the Miami Dolphins since the team first took the field in 1966 and served in this role until 1990. Throughout that time, the Miami Dolphins won two Super Bowls in 1973 and 1974, and Robbie built Joe Robbie Stadium in Miami Gardens — now known as the Hard Rock Stadium. Raised Catholic, Robbie was involved in the Catholic community and was recognized at his funeral by Archbishop Edward McCarthy as a man who generously donated to numerous Catholic colleges. 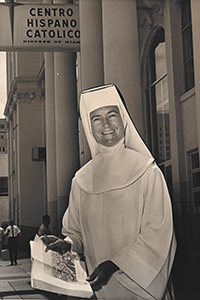 Throughout her lifetime, Sister Trinita, a member of the Adrian Dominicans, held several influential roles, beginning with her title as president of Barry University in the 1970s. After retiring as president in 1981, she became the first woman to hold the position of academic dean at St. John Vianney College Seminary in Miami. She is best known for her role as founding president of the Holocaust Documentation and Education Center at Florida International University and was recognized by Pope John Paul II in 1992 for her exceptional service to the Church. 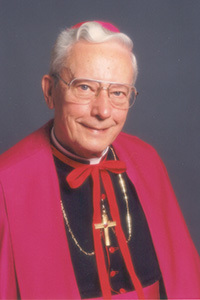 Archbishop McCarthy was the second archbishop of Miami, from 1977 to 1994. Soon after the start of his term, he oversaw the construction of a Pastoral Center. He established the office of Lay Ministry, the office of Evangelization, the Permanent Diaconate program and called for the first archdiocesan Synod in 1985. After his official retirement, the archbishop started planning a new high school in Broward County, which was named in his honor when it was completed in 1997. Bishop Román was appointed by Pope John Paul II as auxiliary bishop of the Archdiocese of Miami in 1979, becoming the first Cuban bishop to serve in the United States in 200 years. Admired for his humility and zeal for evangelization, he became nationally known when he mediated an end to the disturbances caused by Cuban refugees who had been indefinitely detained in Oakdale, Louisiana, and Atlanta, Georgia, after the Mariel boat lift of 1980. 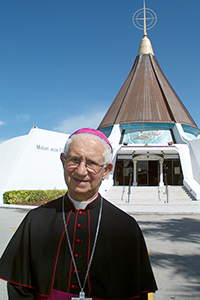 Bishop Román was especially identified with the National Shrine of Our Lady of Charity in Miami, whose construction he spearheaded and where he ministered since 1966. Even after retirement, he remained active at the Shrine, greeting visitors, responding to letters from Cuban exiles and hearing confessions until the last days of his life. Representatives from Cursillos process into the BankUnited Center before the start of the annual Mass for Our Lady of Charity, Sept. 8. Also known as Cursillos, this is a worldwide ministering and evangelization movement that originated in Spain during the 1940s. 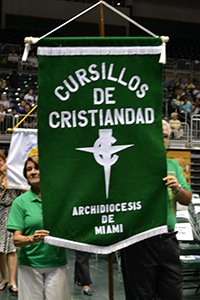 One of the first lay groups formed within the Archdiocese of Miami, the movement provides members with the techniques and tools to invite people into the faith through a three-day retreat experience, followed by weekly mini-lessons — thus the term “cursillos.” Beginning in the early 1970s, Cursillos spawned many other lay groups in the archdiocese, such as Camino for engaged couples, Encuentros Familiares for families, and Encuentros Juveniles for teens and young adults. Known in Spanish as Movimiento Familiar Cristiano, this is a nationwide network of individuals dedicated to guiding the development of couples and families through community involvement and social awareness. Members of CFM meet regularly to reflect and discuss matters related to the Church’s teachings on family and advocate for change and action within the local community. 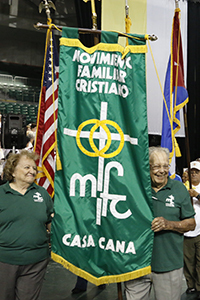 Within the Archdiocese of Miami, the group has continued its work and community involvement through the cornerstones of maintaining a prayerful relationship with God, engaging in ongoing formation, and creating community within the CFM group. Sister Connie, as she was known, helped thousands through her work in the deaf ministry during the 1960s and 1970s. In 1972, she and Father Jim Vitucci were appointed as Church representatives for the deaf community, and they began traveling from parish to parish providing specialized aid. Sister Connie would provide interpreted religious services, coordinate social events and minister to the needs of deaf communities all over the country. In 1986, she co-founded the Schott Memorial Center for the Deaf and Disabled as a non-profit organization, which acts as an extension of the Archdiocese of Miami in addressing the needs of the deaf and disabled in South Florida. Father Vitucci helped found the Schott Memorial Center for the Deaf and Disabled in the mid-1980s, along with Sister Conleth Brannan. Originally purchased by Joseph Schott, the property was then deeded to the archdiocese as an outreach center for the disabled, where Father Vitucci and Sister Connie conducted 35 to 40 programs per week. Prior to his involvement with the center, Father Vitucci led the Archdiocesan Apostolate to the Deaf in 1976 and Commission to the Handicapped in 1982. In 1994, he was assigned as pastor of St. Maximilian Kolbe Parish in Pembroke Pines. He also served as the police chaplain and adviser for Pembroke Pines elected city officials. I was fortunate to have attended the American Dominican Academy one of the three schools run by the Dominican Sister of St. Catherine De'Ricci. The Sisters prepared us unknowingly for the painful and disastrous experience of leaving parents, family and beloved country to come to the United States. I for one will be eternally grateful for the spiritual and academic education the Sisters taught us. ADA continues away from Cuba never forgetting our beloved school and teachers.